Andrinolo, Darío1,2; Pereira, Paulo3; Giannuzzi, Leda1,2; Aura, Claudia4; Massera, Silvia2; Caneo, Mariela2; Caixach, Josep5; Barco, Mónica 5 and Echenique, Ricardo6. 2 - Toxicología y Química Legal. Facultad de Ciencias Exactas. Universidad Nacional de La Plata, Calle 47 y 116 (1900) La Plata, Argentina, TEL-54221-4254853. 4 - Departamento de Patología, Hospital. General San Martín. La Plata. Argentina. 6 - Departamento Científico Ficología, Museo de La Plata. Argentina. Abstract: This paper is the first report on microcystins producer blooms of Microcystis aeruginosa in the Argentinean coast of the Río de la Plata river, the most important drinking water supply of Argentina. The distribution of toxic cyanobacterium Microcystis cf. aeruginosa blooms in the Argentinean coast of the Rio de la Plata river was studied from December 2003 and January 2006. Microcystis aeruginosa persisted in the river with values ranged between 0 - 7.8 104 cells ml-1. Samples of two Microcystis aeruginosa water blooms were collected at La Plata river and were analyzed by the mouse bioassay and by high-performance liquid chromatography with Diode-array and MS detector. The samples showed high hepatotoxicity in mouse bioassay and, in accordance, important amount of microcystins. The bloom samples contained microcystins LR and a variant of microcystin with a molecular ion [M+H]+= 1037.8 m/z as major components. The total toxin content found in these samples was 0.94μg/mg and 0.69μg/mg of lyophilised cells. We conclude that the presence of toxic clones of Microcystis aeruginosa in the Argentinean coast of the Río de la Plata is an actual sanitary and environmental problem and that further studies are necessary to make the risk assessment. Key words: Microcistys aeruginosa; Bloom; Rio de la Plata; Hepatotoxins; Microcystin; HPLC-Diode array. Animal deaths after drinking water containing toxic cyanobacteria (blue-green algae) have been notified for over a century (1,2). In the last decade, toxic cyanobacterial blooms were frequently reported to appear in drinking water supplies causing serious troubles in water treatment plants and resulting in deleterious effects in wild and domestic animals and in the human population (3,4). Cyanotoxins are classified into neurotoxins, hepatotoxins and skin irritants. Although both neurotoxins and hepatotoxins are distributed worldwide (5,6), are highly stable and exposure to these toxins has resulted in toxicity to animals and humans. The hepatotoxic cyanotoxins are produced by various genera such as Microcystis, Anabena, Oscillatoria, Nodularia, Nostoc, Cylindrospermopsis. Most hepatotoxins are generally referred as microcystins (MCs), as they were first isolated from Microcystis aeruginosa (7). MCs have a common structure containing three ßamino acids (alanine, b-linked erythro-ßmethylaspartic acid, and αlinked glutamic acid), two variable L-amino acids, R1 and R2, and two unusual amino acids, N-methyldehydroalanine (Mdha) and 3-amino-9-methoxy-10-phenyl-2,6,8-trimethyldeca- 4,6-dienoic acid (Adda). To date, more than 60 microcystins have been identified (8), being the main toxins MCLR and MCRR. Exposure to MCs occurs orally, but can also occur through inhalation or through dermal exposure. Exposure to MCLR resulted in progressive degeneration of the liver in salmon smolts (Net Pen Liver Disease) in coastal waters of British Columbia, Canada, and the State of Washington, USA (9); livestock poisoning and death (10-12). Human exposure to MCLR is primarily through ingestion of contaminated drinking water (13) and by recreational contact with contaminated water, by consumption of fish or blue green algae products from contaminated water, or accidentally through the use of MCLR-contaminated water as reported in Caruaru, Brazil, where renal dialysis patients exposed to MCLR had liver failure initially and finally death (Caruaru syndrome) (4). In a separate report, exposure to humans resulted in gastroenteritis and dermal contact irritations (14). The Río de la Plata basin is a vast area of 3.000.000 km2 with more than 90 million inhabitants. It is the main source of drinking water for large cities located on its margins, such as Buenos Aires and Montevideo. During summer 1999, short-term blooms of Microcystis aeruginosa were observed in two locations on the Uruguayan coast of the Río de la Plata near the city of Colonia (15). However, the cyanobacterial blooms on the Argentinean margin of the Río de la Plata river as well as the identity of the toxins presents in the toxic blooms at the Río de la Plata basin, has not been described to date. The aim of this study was to study the abundance of Microcystis aeruginosa, toxicity and concentration of toxins in blooms in the Argentinean coast of the Río de la Plata river. Samples were collected in two station from a channel of La Plata port at its most internal zone (34º 50' 0.1''S, 57º 52' 49'W) and in the external zone of the port, in the Rio de la Plata river (34º 52' 26''S, 57º53' 59'') (Fig. 1). Fig 1: Río de la Plata river Map and La Plata harbor area with the location of sampling places 1 and 2. Samples were collected at least one or twice a month from December 2003 to January 2006. Conductivity and pH were measured with Radiometer instruments in the laboratory at least within 1-2 h after the sampling. Temperature was performed by ORION probe system in the field. The samples were stored and transported to the laboratory on ice chest. Qualitative studies of phytoplankton were performed on samples drawn from the reservoir with a 30 μm pore plankton net and analyzed "in vivo" with a photonic microscope Wild M20. For the quantitative analysis, samples were obtained with van Dorn bottles. Subsamples of net samples were also preserved in the field with acid Lugol´ iodine solution for the quantitative phytoplankton analysis and observed with an inverted microscope Carl Zeiss following Utermöhl's methodology (16). Cells were concentrated by centrifugation (10 min, 3000 x g) and then lyophilized for toxicity tests, toxin extraction and HPLC-UV analysis for MCs. Cyanobacterial freeze-dried cells (100 mg) were suspended in 10 ml of a 0.9% NaCl solution and tested for toxicity by mouse bioassay with ICR Swiss male mice (19.5 ± 0.5 g., media ± Desv. Est., n = 3). After intraperitoneal injection (ip), mice were observed continuously. Symptoms and survival times were recorded. Necropsies were done to detect signs of hepatotoxicity. Each liver was fixed in 10% (v/v) neutral buffered formalin. Tissue sections were cut and stained with haematoxylin and eosin. Lyophilised cells were extracted using the procedure described by Krishnamurthy et al., (17) with slight modifications. Briefly, the cells (100 mg) were extracted in 10 ml of buthanol/methanol/ water solution (5:20:75, v/v/v) and maintained for one hour at room temperature by constant magnetic stirring. After homogenisation the extracts were centrifuged, the supernatants were kept and the cell pellets were re-extracted. Supernatants were combined and applied to a pre-activated Sep-Pak C18 ODS, (2 g, Waters). The toxins were eluted with 80 % methanol. Reverse phase HPLC-UV was carried out with a Shimadzu HPLC pump (model LC-6A) connected to a silica based reverse phase C 18 column (Hypersil ODS 5 μm, 150x4,6 mm, Supelco Inc., Bellefonte USA). UV detection was performed at 238 nm with a photodiode array detector (Waters 996). The absorbance spectrum was scanned between 200 and 300 nm. As mobile phase, 0.05 M Phosphate buffer and methanol (58-42) pH 3 was used with a flow rate of 1 ml/min. All chemicals and solvents used were HPLC or analytical grade. Microcystins RR-YR and LR were detected and quantified comparing peak retention times with the standards purchased from SIGMA chemicals (St Louis, MO, USA). Other MCs detected were quantified as LR equivalent. Purification was performed with a semi preparative HPLC method. Briefly, cells were broken by 3 cycles of frozen and unfrozen, and the extract was cut with chloroform/methanol (50/50 v/v), the aqueous phase was concentrated and injected in a 500 μl loop. The High Performance Liquid chromatography system was HP 1100 with degassed module and diode array detector system. The preparative column utilized was TERMO Hyperprep HS C18 (250 x 10 mm) and the mobile phase was phosphate buffer (pH 7.0) with 30% acetonitrile, run in isocratic conditions at 5 ml/min, detection UV-visible (λ=238nm). The peak corresponding to MCLR was collected separately, concentrated and desalted with a C18 cartridge previously activated. MCLR was eluted with a methanol/water solution (90/10) and the methanol was evaporated. The toxin was tested by HPLC-MS method. MCLR, -RR, -YR and nodularin standards were purchased from Calbiochem (La Jolla,) CA, USA). Standard solutions of each analyte were prepared in methanol and stored at -20ºC. MCLR-RR-YR was identified on the basis of both its retention time and mass spectra. Toxins different from the available standards were tentatively identified by comparing the mass spectrum provided by this technique with those available in the literature. Since no patterns of possible microcystin variants detected in the sample are available, the identification of such variants has been performed based on data available in Sivonen and Jones (8). Quantitative analysis were carried out by external standard. Toxins different from MCLR, -RR, -YR was quantified related to MCLR. Calibration curves were calculated daily. Microcystis aeruginosa existed in the Rio de la Plata river throughout the study and the abundance ranged between 0 and 7.8 104 cells ml-1 (Fig. 2). Two blooms were recorded in March 2005 and December 2006, respectively (Fig. 2). Highest abundance was detected on December 2006 (7.8 104 cell ml-1). Fig. 2: The abundance of Microcystis aeruginosa ( ) and temperature ( ) in the in the internal zone of the Río de la Plata River. The surface temperature ranged between 12 and 29.5ºC. Unlike the general trend, both March 2005 and December 2006 blooms occurred in summer, when the surface temperature was above 25ºC (Fig. 2). Cyanobacterial blooms were located along the shoreline looking for water discoloration and samples were taken from two places at the moment in which the blooms occurred. Microscopic analysis of both analyzed blooms revealed that the unique specie responsible for the blooms was Microcystis aeruginosa (Fig. 3). Physical parameters of the two analyzed blooms samples were: water temperature of 29 and 32°C, water conductivity of 678 μS and 345 μS and pH of 7.2 and 7.6 respectively. Fig 3: Microphotograph of Microcystis aeruginosa colony collected from a natural bloom. The bar indicates 10 μm. The toxicity of the blooms was tested by the mouse bioassay and all the mice died after being intraperitonealy injected with one milliliter of Microcystis aeruginosa aqueous extract. The survival times were 40.6 ± 4.0 and 57 ± 12 minutes (mean ± SD n =6) for places 1 and 2 respectively. Necropsies consistently revealed red swollen hemorrhage livers that weighted 65 % ± 9.0 (mean ± SD n = 6) more than those of the control mice. The histopathological analysis of the livers dissected from the mice injected with microcystis extract, showed an alteration in the lobular architecture due to a loss of hepatic cells (Fig 4A and 4B). 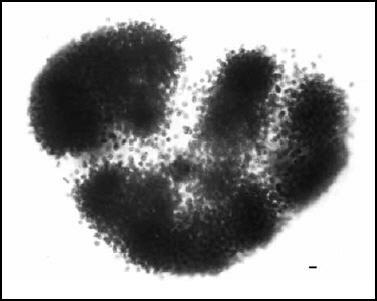 The remaining hepatocites showed citoplasmatic microvacuolation, irregular shaped and sized nuclei, thick lumps chromatin and abundant amount of binucleated hepatocites. The major tissue alterations that could be observed were portal tracts with shape alteration and vasocongestion; the interface parenchyma with partial disruption and dilated sinusoidal spaces. However, histopathological evidence for intrahepatic hemorrhage was not found. Fig 4: Representative microphotographs of hepatic slice from control mice (injected with saline solution) and treated mice (injected with cell extract). (A) control hepatic slice showed (1) Terminal hepatic venule (2) Normal portal tracts and (3) interface parenchyma in radiated disposition. (H-E 25X). 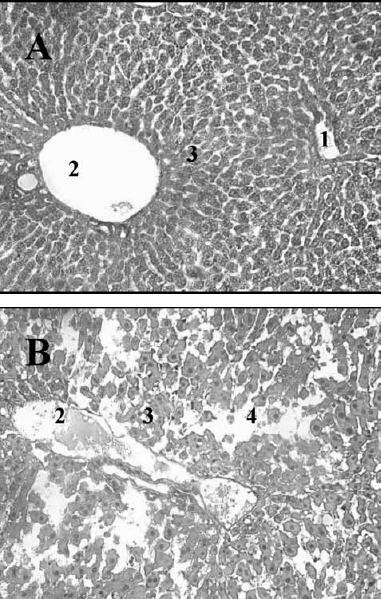 (B) Hepatic slices from treated mice showed (2) Portal tracts enlarged due to important vasocongestion and (3) interface parenchyma disruption and (4) loss of parenchyma. (H-E 25X). Microcystins HPLC analysis of blooms samples reveled that the toxin composition was only slightly changed through samples places 1 and 2. Two major peaks that had retention times of 9.0 and 12.34 minutes respectively, were coincident with the retention times showed by standards of MCYR and LR and have the characteristic microcystin absorbance spectrum (Fig 5). To confirm the identity of peak 1 and 2 they were isolated by preparative chromatography and identified individually by mass spectrometry. Contrary to the result expected, the peak 1 did not correspond to MCYR and was identified as a variant of microcystin with a molecular ion [M+H]+ = 1037,8 m/z. This microcystin could be [ADMAdda5]microcystin -LHar or [D-Leu1]microcystin -LR (8). Peak 2 corresponded to MC LR in concordance with the result obtained by HPLC with diode array detection. Fig 5: HPLC-UV Diode array analysis of (A) Microcystins standard mixture of MCRR, -YR and LR (1 μg each one), (B) Microcystis aeruginosa cells extract where two majors peaks coincident with microcystin-YR and LR are presents (C) Spectrum traces of each peaks showing a characteristic absorbance of microcystins between 200 and 300 nm with a maximum absorbance at 238 nm. Cyanobacterial blooms in the Río de la Plata river are frequent and generally occur in summer. In most cases M. aeruginosa is responsible for the formation of unspecific, widespread blooms with high cell densities (19,20). This phenomenon occurs in areas where human activity or pollution are intense, specially near urban centers, where anthropogenic inputs by domestic, industrial and urban discharges have been identified as the primary cause for the eutrophication in the Río de la Plata river. Reports of people suffering some kind of gastrointestinal disorder after bathing and swimming are quite frequent but not published. In fact, there are no epidemiological records available. Events of massive fish mortality associated to algal blooms, as occurred a few days before this study was carried out, are also typical. The most common hepatotoxins in freshwater environments are microcystins, with 60 structurally different microcystins described (21). A toxic profile of the Rio de la Plata river is showed for first time. Microcystis cells show two major components, with a characteristic absorbance spectrum of MCs, MCLR with 0.58 and 0.69 μg.mg-1 of lyophilized cells in samples 1 and 2 respectively and the other microcystin (ADMAdda5]microcistina- LHar o la [D-Leu1]microcistina-LR) present with 0.20 and 0.24 μg.mg-1 of lyophilized cells in samples 1 and 2 respectively) are the first microcystins identified in the Rio de la Plata river. In a HPLC with diode array system for microcystin analysis both, time retention and spectrum absorbance constitutes condition of identity. This criteria of identity could be not sufficient and results in mistakes. In this case, the MCYR standard had the same retention time and spectrum than other microcystin (ADMAdda5]microcistina-LHar or [D-Leu1]microcystin-LR). It is necessary to incorporate more technology for the study of cianotoxins in Rio de la Plata river. The MCs levels detected (0.93 and 78 μg.mg-1 of dry weight in samples 1 and 2 respectively) were similar to the values found in a toxin-containing bloom of M. aeruginosa in the Uruguay side of the Río de la Plata river (15). This finding suggests that this toxic phenomenon is widely spread in the Rio de la Plata low basin. The high toxicities detected in the mice bioassay can be explained from the high content of toxins in the cell extract detected by HPLC analysis. In the mice bioassay were injected in 1ml of extract with 94 μg of microcystins. This is an i.p dose of 540 μg.kg-1, almost ten times higher than LD50 of 50 μg.kg-1 body weight estimated for microcystins (7). The analysis of the livers dissected from the mice injected with MCs extract showed a disrupted lobular architecture and loss of hepatic cells without evidence for apoptotic process.A more intense colour was observed in the hepatocites nuclei and also a higher number of cells with binucleation, in comparison with the control group. Both conditions due to an intense nuclear activity, suggesting that an intense process of cell reparation induced by microcystins take place. By other hand, there were not histopathological evidences for the intrahepatic hemorrhage because there were not blood cells within the extravascular space as is expected when an intrahepatic hemorrhage occur. We conclude that the typical swollen liver observed in microcystin injected mice is due to vasocongestion. This paper is the first report on microcystins producer blooms of Microcystis aeruginosa in the Argentinean coast of the Río de la Plata river, the most important drinking water supply of Argentina The risk for human consumption of microcystins present in drinking water is high due to the fact that the Río de la Plata river is the most important water supply for important cities such as Buenos Aires and La Plata; and that the conventional water treatment techniques actually used such as coagulation, sedimentation, filtration and chlorination could be not effective for removing microcystins. More studies are needed for evaluating the sanitary risk of M. aeruginosa blooms in the Rio de la Plata river. We want to thank to Lic. José Maria Guerrero for his critical review of the manuscript.